Okay, here it is! I’ve been working on this one for a while. 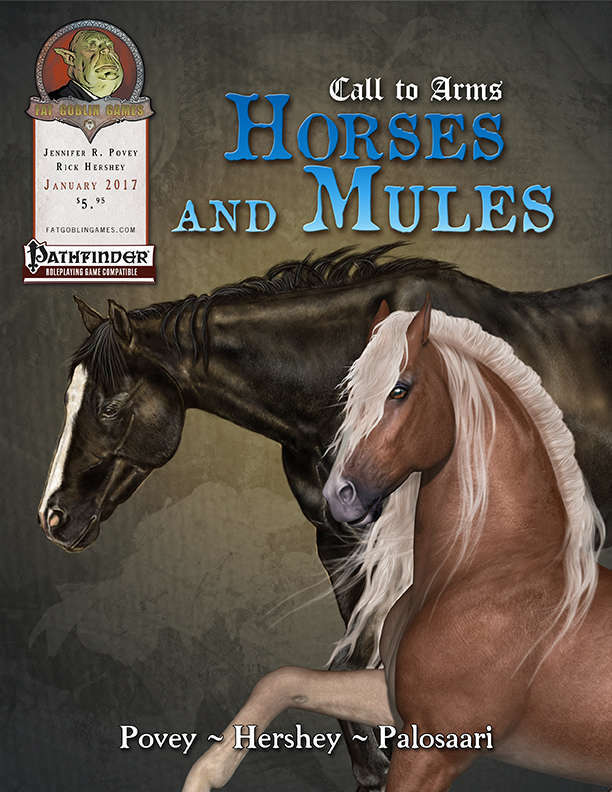 Call To Arms: Horses And Mules is a Pathfinder supplement designed to expand and improve rules for using horses and other equines as mounts, monsters and, basically, to encourage doing things with the party’s horses other than tethering them outside the dungeon and hoping they are there when you get back. It includes new feats for riders and mounts, new horse and mule types, a bunch of new monsters, and information on how to roleplay horses and mules. It’s intended for simulationist GMs, for campaigns in which long journeys are important, and for players who enjoy Cavaliers, Paladins, etc.